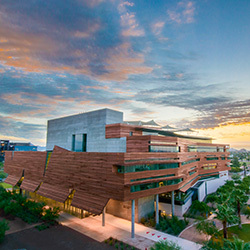 The founding of the University of Arizona College of Medicine – Phoenix was the result of many years of effort by educators, community leaders, legislators, regents, physicians and others who dedicated years to pursuing the vision and eventual realization of the goal of creating a college of medicine in Phoenix. This timeline provides a high-level view of our history and just some of the many people who made this highly sought-after dream a reality for Phoenix and the state of Arizona. 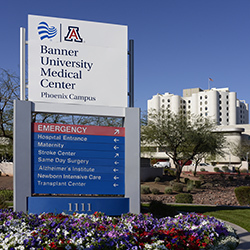 November - The Accreditation Council for Graduate Medical Education grants the University of Arizona College of Medicine – Phoenix's Graduate Medical Education Program full, 10-year sponsoring institutional accreditation at Banner – University Medical Center Phoenix. July 24 - The College welcomes a New Dean, Guy Reed, MD, MS.
June 9 – The Liaison Committee on Medical Education grants College of Medicine – Phoenix full accreditation. May 8 – 81 students graduated. February 23 – At the 10-year anniversary celebration for the College, Mayor Greg Stanton is presented with a framed picture of the BSPB for his continuous dedication to and support of the University of Arizona College of Medicine – Phoenix. February 23 - The 245,000-square-foot research facility Biomedical Sciences Partnership Building opens on the Phoenix Biomedical Campus. The building has wet laboratories specialized for cell biology, molecular and biochemical investigations, cores include flow cytometry/immunology, microscopy, histology, biorepository/tissue culture in support of funded research and new projects. June 16 - Jacqueline A. Chadwick, MD, is recognized as Esteemed Professor of the College and Founder of Phoenix Programs. May - A new instrument for studying a biological model of the human gastrointestinal tract that mimics the actual conditions and processes that occur within the intestine is developed by the UA College of Medicine – Phoenix’s Frederic Zenhausern, PhD, MBA, at the Center for Applied NanoBioscience and Medicine. May 10 – 66 students graduate. April 15 - Stuart Flynn, MD, is recognized as Esteemed Professor of the College. April 2016 - June 2017 - Kenneth Ramos, MD, serves as Interim Dean. March 9 – Michael Grossman, MD, is honored with the Emeritus Professor designation. March 3 – Mark Haussler, PhD, is honored with the Emeritus Professor designation. February – The Liaison Committee on Medical Education grants College of Medicine – Phoenix provisional accreditation, an intermediate step towards full accreditation. November 15 – Record number of applications received: 5,358. August 13 - The University of Arizona Cancer Center at Dignity Health's St. Joseph's Medical Center opens. This facility is an extension of the only NIH-designated comprehensive cancer center based in Arizona. May 11 – 54 students graduate. March - Banner Health officially merges with what was formerly known as the University of Arizona Health Network to create the Banner – University Medicine Division. August - The Arizona Board of Regents votes to authorize discussions to combine the University of Arizona Health Network and Banner Health to create a long-time partnership with the UA Colleges of Medicine. This primary clinical partnership represents a powerful opportunity for the UA College of Medicine – Phoenix to expand and enhance its education, research and patient care. May 12 – 37 students graduate. The economic impact of the overall biomedical campus in downtown Phoenix in 2013 is nearly $1.3 billion, of which $961 million is attributed to the UA College of Medicine – Phoenix presence. August 5 - J. Kipp Charlton, MD, Melvin L. Cohen, MD, and John Mattox, MD, are recognized as Esteemed Professors of the College. July – The first class of students begin at the College of Medicine - Phoenix (separately accredited). May 8 – 50 students graduate. The University of Arizona, home to Arizona's only MD-granting medical program, establishes its second, separately accredited medical school in downtown Phoenix - the first ever MD-granting medical school in the city. October 5 - The Health Sciences Education Building opens. The state-of-the-art building is a six-story facility with lecture halls, the Center for Simulation and Innovation, clinical education units, anatomy lab, offices and various flexible classrooms. July – Class size increases to 80 students admitted per year. July – The Liaison Committee on Medical Education grants preliminary accreditation to the College of Medicine - Phoenix and allows the College to recruit applicants and enroll students. May 9 – 40 medical students graduate. A portable rapid DNA analysis technology that can sample and match a DNA profile to a secure national law enforcement database is developed by the UA College of Medicine – Phoenix's Frederic Zenhausern, PhD, MBA, at the Center for Applied NanoBioscience and Medicine. Gholam Peyman, MD, faculty member at the UA College of Medicine – Phoenix, is awarded the "National Medal of Technology and Innovation" by President Barack Obama for the invention of the LASIK surgical technique, expanding the field of retinal surgery. May 12 - First class of 24 medical students graduate. October – The American Medical Association validates a study led by Bentley J. Bobrow, MD, professor of Emergency Medicine at the College and associate director of the Arizona Emergency Medicine Research Center – Phoenix, concluding that chest-compression-only CPR improves the survival rate of patients with out-of-hospital cardiac arrest. The Sarver Heart Center Resuscitation Research Group published the study. April - Citing financial concerns, Arizona State University formally withdrew from the partnership with the University of Arizona College of Medicine. The Arizona Board of Regents (ABOR) approved the change on May 1, 2010, giving the University of Arizona full responsibility for operations at the downtown Phoenix campus. July – Class size increases to 48 students admitted per year. May 2008 - April 2016 - Stuart Flynn, MD, becomes the long-standing Dean of the Phoenix program and leads the effort for separate accreditation. presence on the PBC by opening the Arizona Biomedical Collaborative Building with Arizona State University. August 10 - The College's inaugural class holds its White Coat Ceremony. August 2 – Inaugural class of 24 students begin matriculation. July – The College opens its doors as a four-year branch campus. March 2007 - April 2008 - Edward Shortliffe, MD, PhD, is named founding Dean. February – The Liaison Committee on Medical Education approves the College of Medicine’s plan, with the leadership of Keith Joiner, MD, MPH, dean of the UA College of Medicine and vice provost for medical affairs to expand Phoenix to a four-year educational track. October 10 – The beautifully restored historic buildings, formerly the Phoenix Union High School (built in 1911), are opened and dedicated. The beautifully restored buildings are recipients of the 2006 Arizona Institute of Architects Citation Award and the 2006 Arizona Governor’s Heritage Preservation Honor Award and capture the imagination of the city, the faculty, and the students. The Department of Basic Medical Sciences if formally established under the leadership of Mark R. Haussler, PhD, who begins recruiting the founding faculty. December - A request is made to Arizona Board of Regents to establish the Department of Basic Medical Sciences as the first academic unit for the new College of Medicine - Phoenix program with the goal for the department and its faculty to develop, implement, monitor, and evaluate the basic science component leading to the MD degree, as well as to establish basic science research and graduate programs. September 6 - Beth Schermer, a local health care attorney, is appointed by Napolitano to serve as Vice Dean for Administration to oversee the development of the College of Medicine - Phoenix. September - Regents Professor Mark R. Haussler, PhD, from the College of Medicine - Tucson, moves to Phoenix to become interim head of the proposed Basic Medical Sciences Department. He leads intensive efforts to recruit the founding faculty with participation from representatives of UA College of Medicine - Tucson, Arizona State University, the Translational Genomics Research Institute, Banner Health, and St. Joseph’s Medical Center/Barrow Neurological Institute. May 20 - House Bill 2768 is signed by Gov. Janet Napolitano, appropriating $6 million for the UA College of Medicine – Phoenix. Mayor Phil Gordon, a proponent of historic preservation, suggests that the Phoenix Union High School buildings be restored. Renovations begin on the historic buildings. December - TGen opens state-of-the-art facilities on the Phoenix Biomedical Campus. August 4 - The Arizona Board of Regents (ABOR) approves an agreement to expand the operations of the College to a four-year program - an unprecedented statewide collaboration of the ABOR, three state universities, the City of Phoenix, the Translational Genomics Research Institute (TGen) and Phoenix-area teaching hospitals. Guided by a governor-appointed commission, this leads to the establishment of the downtown Phoenix Biomedical Campus (PBC). The property is provided by the City of Phoenix, ultimately becoming home to the College and its PBC partners. July - Arizona Board of Regents President Gary Stuart convenes a meeting between himself, University of Arizona President Peter Likins and Arizona State University President Michael Crow to discuss a Memorandum of Understanding that would create a four-year program between the University of Arizona College of Medicine – Phoenix in collaboration with Arizona State University. Newly elected Mayor of Phoenix Phil Gordon continues to push forward prior Mayor Skip Rimsza’s initiative that the regional campus of the College of Medicine be located on land in the heart of downtown Phoenix, part of a future Phoenix bioscience campus. City of Phoenix and Arizona Board of Regents agree on lease for UA College of Medicine - Phoenix buildings. December - The College opens UA space in an office complex at Third Street and Indian School Road. A Phoenix program is officially established, allowing third- and fourth-year Tucson-based UA College of Medicine students to complete rotations at affiliated hospitals in Phoenix. 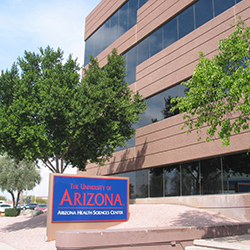 July 1 - The College opens a 300-square-foot office at the Maricopa County Medical Society building. The office begins with the appointment of Jacqueline A. Chadwick, MD, a well-known family practice physician, as Associate Dean for the Phoenix programs, significantly increasing its medical education presence in the Phoenix area throughout the 1990s. 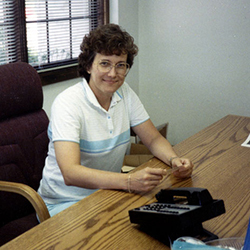 Holly DelHousaye is hired as Dr. Chadwick’s first administrative assistant. One-third of the UA College of Medicine students spent a portion of their third year in Phoenix. January - A Liaison Committee on Medical Education site visit to the UA College of Medicine establishes the need for an administrative presence in Phoenix to support the college’s academic programs. Medical students at the UA College of Medicine take required clerkships in internal medicine, pediatrics, neurology, obstetrics and gynecology, and family practice, as well as clinical electives in the Phoenix area.